Creative Montage: An Exciting Giveaway! I just had to share this amazing contest with you my darling readers! If you are in the New York area, you do not want to miss this opportunity to win TWO free tickets to this stellar event! You can WIN 2 free tickets to this amazing wedding event created by The Wedding Salon and all you have to do is leave a comment in this post (be sure to leave your email address!!!) and the 10 winners will be chosen at random. This giveaway will close at midnight on Monday and the winners will be announced on Tuesday morning! Pass this awesome opportunity along to your friends and family....this is one event that should not be missed! Woo Hoo! very exciting, I'd love to attend. Hope I win. This would be the perfect way to spend an afternoon and evening. I would be thrilled to win! I'd love to attend! I sure wouldn't have a case of the Mondays! 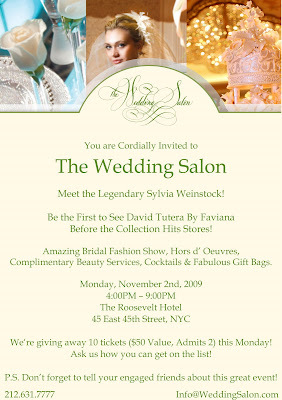 It would be an honor to win as The Wedding Salon is such a great event filled with some amazing vendors! I would love to win! My fiance and I live in NYC and this would be perfect!